It was a week with plenty of Episcopal Church news. Beyond a significant lawsuit (which you should read about here, here, and here), there was plenty of other stuff to note. I was especially interested to learn that General Convention 2021 will be in Baltimore. Guess that means if we don’t like how it’s going halfway through, we can pack up and leave like the Colts did. What interested me even more, enough to yield a blog post, was the draft schedule announcement for General Convention 2018 to be held next year in Austin, TX. WARNING: Serious church geekery coming up. If that’s not your thing, move right along, and come back for the next blog post. First off, let’s talk about the location. Aside from the fact that it will be approximately 173 degrees in Texas in July, I’m glad to be going to Austin. Of course, if the Texas legislature doesn’t get its act together, we might be shopping for a new venue. I want to head off a criticism of the location that sometimes comes up right about this point in a conversation among church geeks. Sometimes people say that we shouldn’t have a convention in a diocese which doesn’t pay its full asking. Every diocese is asked to contribute 18% of its revenue to the churchwide budget. Well, let’s start by acknowledging that it’s an “asking” not an assessment, so it’s not totally fair to treat it as a mandatory payment. Also, if we don’t like having Episcopal Church functions in places that pay less than the requested 18%, then we should move the Episcopal Church Center (New York was to pay 15.7% last year) or the National Cathedral (Washington was to pay 12.6% last year). Meanwhile Texas was to pay 13.3% in 2016, and more in dollars than any other diocese. So unless we’re going to start getting upset about East Coast dioceses, let’s give Texas a pass and even commend their increased commitment to churchwide ministry. We also need to have a very long conversation about diocesan revenue and churchwide budgets. For now, I’m not particularly inclined to fault dioceses who choose for various reasons not to send the full asking. As usual, I have digressed. Have a look at the draft schedule for General Convention 2018. Here’s the graphic from the General Convention office, or you can grab the PDF and print your very own copy. Step back and gaze at this schedule. There are a few things to notice. The thing is packed. There’s very little free time, and meal breaks are pretty short. Most days Deputies and Bishops will start around 7 or 7:30 a.m. and go through at least 10 p.m. once you include evening meetings and diocesan gatherings. It’s a slog. We’ll come back to that. 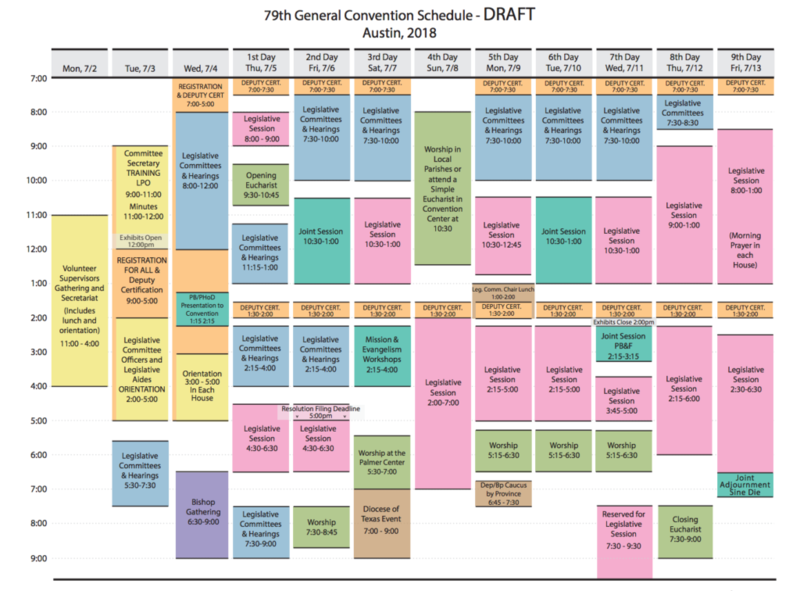 Before I comment further on the 2018 schedule, I invite you to have a look at the schedule for General Convention 2015 (PDF). Mostly they’re similar. You’ll see lots of time in legislative committees and legislative sessions, which makes sense for a convention, right? There are times for worship and local gatherings. Both schedules maintain the fiction that General Convention is nine days long, when it is really 12 days long. Here are a few changes I noticed in the 2018 schedule compared with the 2015 schedule. I did the math pretty hastily, so if you find a mistake, please let me know. Time spent in legislative session increases from 34.75 hours to 40.75 hours. Time spent in legislative hearings increases from 22.25 hours to 26.25 hours, not counting special hearings, which stays about the same. Time spent in worship decreases from 10.25 hours to 9.25 hours, not counting Sunday. Speaking of Sunday, instead of a festive service at the convention center as in recent years, attendees will be encouraged to attend local churches, though there will be a “simple Eucharist” at the convention center. This seems like a positive change, because I like the idea of folks experiencing local churches in Austin and environs. The logistics will be a challenge, but I’m sure there’s a good plan for that. “Mission and Evangelism Workshops” have been added this time, to the tune of 1.75 hours. This is terrific. I hope many of the people from across our church will be invited to lead workshops, and I pray that participants will be inspired by what they learn to go home and be transformational change agents. If this works well, maybe we will see more opportunities for formation at General Convention in future gathers. There are other sundry differences, but these are some of the major ones. I have a few thoughts on General Convention. So as to avoid writing a book, I’ll confine myself to just a few topics. Length of Convention. For those of us who are able to go, the convention is workable, and even fun at times. The lighter schedule on Sunday, coupled with a goof-off day (hello, alternate deputy!) makes it work. More so than the grueling schedule for people who attend, the bigger problem is people who cannot come. As the schedule is currently configured, a working person will need to use two weeks of vacation and give up two weekends to attend General Convention. This means that it’s onerous for anyone who’s not retired or employed by the church to come. Other churches (ELCA in our country; other Anglican bodies around the world) manage to hold churchwide gatherings that are much less than two weeks long. I’m going to go out on a limb and say we could find a way to do the same. If we want the convention to accessible to as many people as possible — and to make it easier for younger, working people to come — we need to change the length of convention. Worship. I am concerned by the way worship seems to be pushed off to the side. As I read the schedule, it will be tough for people to make it to worship and also eat evening meals. It would be nice for people not to have to choose between supper and worship. The other change is that we’ve gone from “Eucharist” to “worship” for most of the evening services. Maybe that’s just a difference in the word someone chose, or maybe it means evensong instead of Holy Eucharist? Now, I personally have a preference for daily Eucharist, but I do understand that others would prefer the Daily Office. So chalk that up to personal preference. However, the rules of order in the House of Bishops require them to have a service of Holy Eucharist every day. So if there’s no convention-wide Eucharist planned, they’ll need to have their own private service in the HOB or change their rules of order. This is especially true on the final day of convention, when no convention-wide public worship service is planned. On the final day of General Convention, it would seem important to have both houses gather together for worship, rather than praying in their separate corners. I also hate to see us prevent our visitors and guests from experiencing Episcopal worship each day of convention. Were it up to me, we’d continue to offer daily Holy Eucharist and make the service in the morning or at mid-day. So some of my resistance here is, if I’m honest, “I don’t like change”, and some of it is perhaps deeper. I also very much hope that we’ll carefully and scrupulously use authorized services of our church. 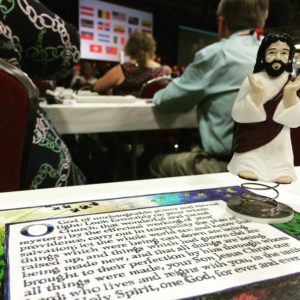 It seems especially important at General Convention to follow our own rubrics and to use authorized worship texts. I hear talk of “innovative” worship at this convention, which could mean several things. Maybe it means using one of the four creative, roll-your-own Eucharistic prayer services from the BCP or Enriching Our Worship. But even these creative options have some rules (such as using the provided Words of Institution in the Eucharistic prayer). At the last General Convention, most of what was offered was congruent with our rubrics, but there was more divergence than at previous General Conventions. I’d like to see us hew closely to rubrics for these gatherings. At a time when there will be conflict and a diverse gathering, it is essential to practice our charism of common prayer. Using our common prayers is the most generous, hospitable way to pray at churchwide gatherings. Mission / Outreach Work. I continue to hope that one day, the General Convention have a field day where deputies and bishops do local mission work or go on mission pilgrimages. It’s hard to us to claim with credibility that mission is important if our schedule doesn’t show it. For where you schedule is, there you heart will be also. Legislative Time. While time for worship decreases, time for consideration of legislation is up about ten hours. We wouldn’t need to do that if we could enact from further reforms of the legislative process. At last General Convention, President Gay Jennings spearheaded some real reforms that helped us to do our work more efficiently. I commend her and her leadership team for that, and I’d like to see more. While some people favor limiting the scope of resolutions up for consideration, I would probably oppose this. Deputies and Bishops should have freedom to introduce any matter that is not out of order (which is a pretty narrow scope) for the body’s consideration. As it should be. So what can be done. It’s too easy to add a resolution to the calendar. Right now, any three deputies can put a resolution into the hopper, thus forcing 1,000 people to take up a topic. I’d like to see that number be 25 or even 50 deputies. With electronic systems, this need not be burdensome (no clipboards and paper; just electronic registration). I don’t know what the right number is, but it should take many more than three deputies to put something on the collective agenda of hundreds of people. One of President Jennings’ reforms was to streamline the flow so that the strong default for legislation is the consent calendar. This allows the Houses to vote on many resolutions all at once. The problem is that it’s too easy to pull stuff off the consent calendar and force debate. Right now, any three deputies can force an item to be debated. Again, that bar should be much, much higher. 20 or 25 or more would be a more reasonable number. Similarly, any three dioceses can force a “vote by orders” which is too complicated to explain here, but which offers a more complicated voting procedure with a higher bar for certain items. Allowing three dioceses to do this made sense back in 1785, when where were only nine dioceses. That meant that one-third of dioceses could get everyone to go through this more complicated process. Now that we have 108-ish dioceses and diocese-like entities, three dioceses is also not a high enough bar. That number should be 10 or 20 or more dioceses. Again, with electronic systems, this need not be burdensome. These changes alone would decrease the number of resolutions we consider and make us more efficient in considering them. That would help. But wait, there’s more. My more radical idea is to consolidate political advocacy resolution into an omnibus resolution. So instead of individually considering 117 (I made that number up) resolutions urging the Episcopal Church to take certain positions or advocate certain policies, we could combine them into one resolution to be debated under special rules of order with limited floor time. We already do this will our budgeting process. So if we must consider these kinds of resolutions (and I don’t think we need to consider as many as we currently do, but that’s another blog post), we could certainly do it more efficiently. Committees could still hear testimony on this omnibus resolution, so we’d be able to get important points on record. For further thoughts on political advocacy resolutions, see my 2015 blog post on legislative slacktivism. Likewise, we should combine all the resolutions thanking people or commending things. Because proponents of these commendy resolutions want to get to the mic to talk up the thing for which they’re grateful, many of these get pulled off the consent calendar. Which means we use hours and hours saying yay and thanks. It’s not that I’m ungrateful, but I just don’t think it’s a great use of 1,000 people’s time. So let’s combine all these into an omnibus commendation and use an hour or two of floor time for the purpose. All the people who are thanked or commended will still get a nice letter from the Secretary of General Convention, which seems to be the real value of these resolutions anyway. Please don’t hear me saying something I’m not. I am profoundly grateful for our legislative process and its (mostly) transparent nature. I love that lay people are essential at every level of governance, and I’d fight for that all the way. My suggestion is that we use our time more wisely on matters that require our full attention. Sometimes less is really more. Leisure and Networking. General Convention is part legislature, part marketplace, part revival, and part family reunion. My favorite thing about General Convention (besides worshiping with fellow disciples from around the world) is seeing old friends and meeting new ones. Most everyone I meet says the same thing. What would it be like if we had more unscheduled time? What if we were done every day at 5:00? This is impossible now, but if we did a few of things I’ve suggested above to streamline legislation, we’d have way more time for stuff other than legislation. The Body of Christ might be strengthened in new and surprising ways. I was glad to see that this convention will have a theme, “The Jesus Movement: Loving, Liberating and Life-giving.” There is so much depth and breadth there for us to explore and savor. 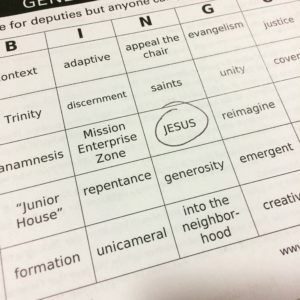 If nothing else, House of Deputies Bingo will be easier, because more people will be saying Jesus all the time. But seriously, I wonder how the General Convention schedule itself squares against this theme. Is it loving, liberating, or life-giving to spend more than ten days working for 15 hours each day? Are there ways we could adjust the schedule to be more loving? More liberating? More life-giving? I do believe Jesus is present in our legislative deliberations. Maybe he’s rolling his eyes sometimes, but plenty of holy stuff happens as we debate important issues and even when we go down parliamentary rabbit holes. Still, as much as I love General Convention, I can’t help but wonder if it could be even better and even more accessible to a broader demographic. I wonder if people could leave transformed and empowered to proclaim the Good News of God in Jesus Christ back in their local communities. Thanks be to God we have presiding officers and solid leadership teams who love Jesus, love the Episcopal Church, and love the details of organizing our triennial gathering. Pray for them, that they may be strengthened and supported in their work. Pray for them, in gratitude for their witness. Pray for us all, that we might always and everywhere be about Jesus above all else. Also, I do like the idea of worshiping in local parishes on Sunday morning. But I understand that in addition, there will be a festive Convention Eucharist on Saturday evening, which will be for not only Convention-goers, but also the local community, and that significant work will be done to invite and encourage non-Episcopalians to come. It will be a mini-Episcopal Revival (or maybe a major one), and will be combined with the Diocese of Texas Event on the calendar for right afterwards. A much larger gathering facility has been rented for the occasion, because Texas is going all out and doesn’t think the crowds will fit in the regular convention hall. Could be very exciting! So there’s evangelism work going on in connection with this Convention, which may or may not be what you meant by doing mission and outreach work, but I’m looking forward to being a part of it! Susan, thanks for your comment. Right, I know that the asking turns into an assessment (unless you ask really nicely for an exception) in 2019. But for now, we’re still talking about askings. Anyway, we’re on the same page re: Texas. I didn’t know we were encouraging non-Episcopalians to come on Saturday night, which is great news. I know Texas will put on a great event, and I’m glad to hear that the worship service is being opened up to other locals. That’s really great. So far, it had read as if the intent was to invite other dioceses (which is also cool) rather than non-Episcopalians. I hope if we’re doing that, we’ll have good infrastructure for evangelism set up. I’m thinking we’d need ways to connect people to local churches and so forth. As for mission/outreach work, I was thinking more along the lines of visiting local justice/outreach initiatives or finding ways to enlist people in local justice/outreach work. Anyway, thanks for stopping by and commenting. See you in Austin (and no doubt before that). I liked what the local ECW did in Salt Lake City – having a 5 K on Sunday morning to raise funds for a youth homelessness charity. It was scheduled so that the participants had time to clean up and make it to church. Unfortunately, BIshops Against Gun Violence scheduled their march for the same time, so they didn’t get as many participants as they were hoping for. I thought that the BAGV could have scheduled their event at another time. I love the idea of the Bishops and deputies attending local churches on Sunday, it is a way to really connect the local congregations to General Convention – something that is always a challenge. And, finally, I’m excited about the possibility that some worship will not be Eucharists. As someone on the more Protestant end of the Episcopal Church, I prefer not to receive communion every day and I found the Eucharists to focus more on the variety of music and texts and less on making the liturgy of the Word a meaningful worship experience. Three quickies: A Convention “Octave” should be more than sufficient; at 12 days, it rivals Christmastide and in my view, GC doesn’t merit a “Season!” Secondly, gratitude is wonderful, even essential for spiritual health, yet I couldn’t agree more with your suggestion of putting the “hail fellow well met” stuff into a single commendation. What about just having everyone stand up, turn to the left/right/forward/back and say “thank you” to each person within close reach? If anyone doesn’t feel “thanked enough” let them petition the chair (I think 50 signatures is just right, and 10 dioceses) for “special attention!” The current practice fosters the already oppressive “culture of volunteerism” which the church has fallen prey to; I pray for a culture of missional discipleship in which we don’t always have to be giving people pats/slaps to affirm them. Church as “mutual admiration society” has got us where we are, and it ain’t pretty! Finally, in my, albeit limited, experience (two GCs) it has never ceased to trouble me that the people in attendance are, more often than not, those who can “afford” to be there (aka independent wealth/resources) and/or whose expenses are paid by an entity, and the staffers/delegates with vested interests. “The people of God” are underrepresented and, given the sometimes circus-like atmosphere, maybe that’s just as well. All the best in Austin. I’ll be praying from my beachchair on Block Island Sound, seabreezes and bracing saltwater at my feet!